Last time not worn: 1984 when it was retired. With some players I wonder if things would have been different had they finished a long career wearing the Birds on the Bat. But in other cases such as yesterday and again today, once a Cardinal and you are always in the family. The Boyer boys are baseball in the greater Joplin area, and it must have been some October to remember back in 1964 in SW Missouri. Riding Ken’s MVP season, St. Louis would meet up with New York in the World Series with a familiar last name manning the hot corner. Clete Boyer certainly didn’t want to give his big brother any bragging rights and had plenty on the line for the vaunted Yankees, who were back in the Fall Classic for the 5th consecutive year. Over the course of the first three games, both third baseman were struggling in the back and forth affair before one swing in the pivotal 4th changed the course of Cardinals’ history. If Ken doesn’t atone for his first inning error with a Grand Slam in the sixth, Gibby’s masterful 10-inning Game 5 is merely a footnote. But that home run did put the life back into St. Louis and paved the way for the rest of the 60’s success. He just wasn’t a direct contributor to the other two World Series squads, having been dealt after the 1965 campaign. Boyer bounced around after that with a decline in stats impacting how the game viewed his Hall of Fame worthy career. Even without the ultimate recognition, he embarked on his second baseball career back where it all started. The seven time All-Star began the trek up the ranks in the Texas League, managing Arkansas in 1970 and then Tulsa for three years on the way to 1978. 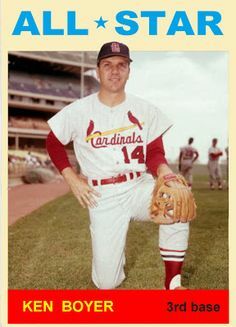 Boyer got the call to come home yet again, donning the #14 in hopes of turning around a slumping Cardinals crew which he did in 1979. His tenure under the Arch lasted just long enough to help pass the torch to Whiteyball, completing a masterful run that began in 1955. Boyer didn’t get to see his number retired, however, but I think he enjoyed the best seat in the house for another historic run in 1982. Baseball has always been in my blood and as a third generation St. Louis diehard, I wish nothing more than a great game two weeks from today. My brother will be at Wrigley, as he lucked into some great seats for the re-opening, but I’m okay with watching from the comfort of my living room. He is a fan of the enemy after all, so it would be just fine by me if the Cards prove to take a liking to the new setup!